I've been really busy lately, but I am trying to manage my time better in order to get more things done. I need more "at home" time! I've been trying to make use of little pockets of time, such as the minute or two it takes for a cup of coffee to brew, or if I can get ready for work fast enough in the morning, there might be a few minutes left for crafting or cleaning. Using small pockets of time works well for sewing projects. 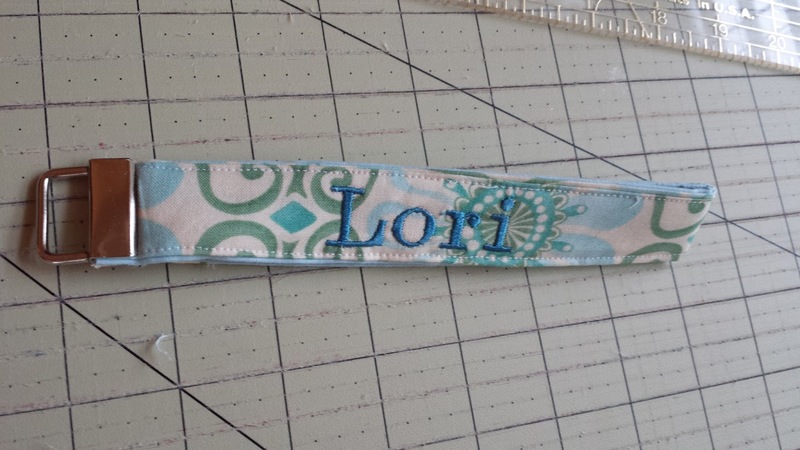 Here are some key fobs I've been working on lately. This one is for my daughter. This one is for my friend and coworker. This is one in progress for my daughter-in-law. I finally learned how to download embroidery patterns from the internet! I bought this curly monogram from an Etsy shop. 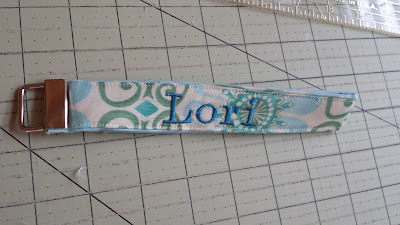 This was just a practice piece, using some scrap fabric, but you can see how it will turn out. 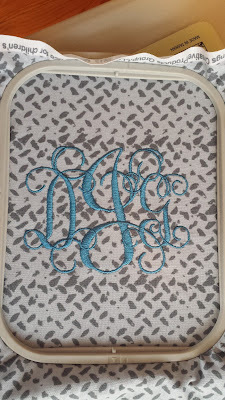 I am going to be putting monograms on bags, and more, for gifts. In pockets of time, I can work on them in baby steps. 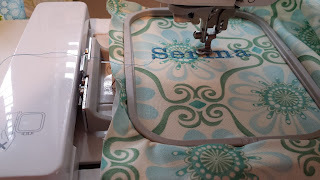 The first step is to choose the fabric, followed by pressing the fabric and putting it and the stabilizer into the hoop. 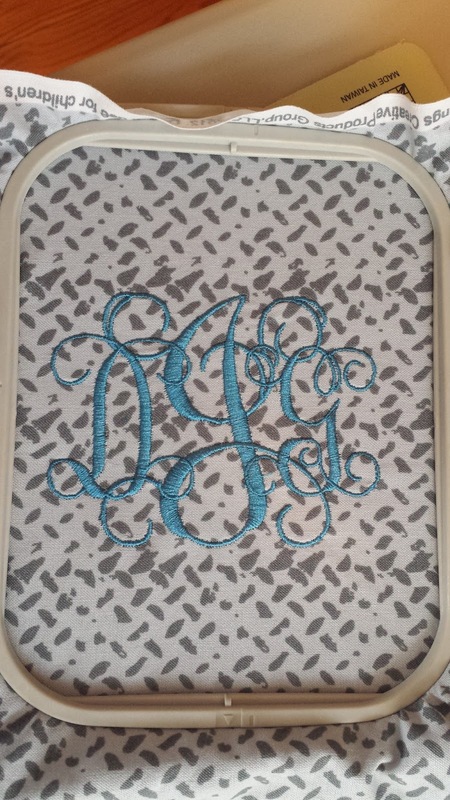 My monogram on scrap fabric. The majority of my pocket time has been used to water plants in the yard during this whole summer. Thank goodness for some rain lately, which allowed me to skip my watering chores occasionally. 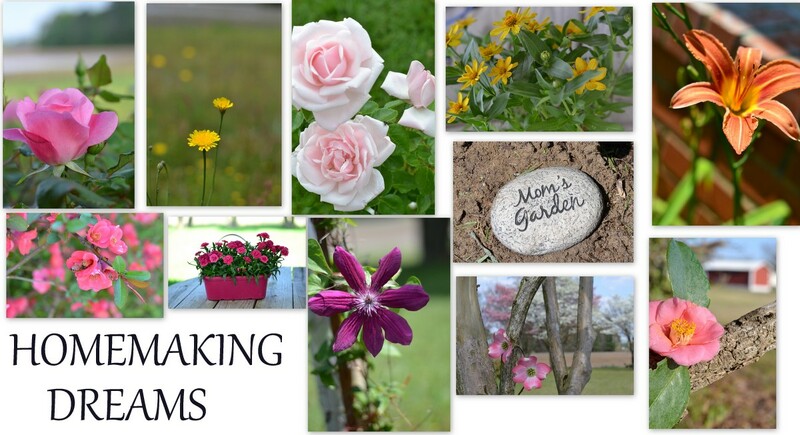 I'm looking forward to fall and winter and more time for homemaking and crafting. Wow, we sure have had the rain, haven't we? You are really good with your monogramming and I just love my key fob that you made for me. 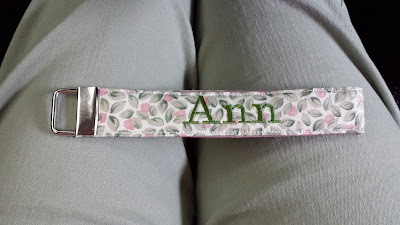 Penny is one of those names that never pops up in the standard personalized items we sometimes see for sell. I like your take on pockets of time. I have plenty of time these days, but don't seem to utilize it very well. I keep thinking I need to start looking at my days as my former work days and plan to stay busy during the whole 8 hour shift. Imagine the things I could get done! Back in the day, when I watched t.v., I used to call those quick little spurts commercial cleaning!